Our favorite workout is swimming along the shoreline that runs fairly straight when the surf is high. We love to swim along the surf break just right outside where the ocean waves start to break. As we swim parallel to coastline, we are in a great location to watch the big rollers come in and then body surf to shore when the timing is right. Not only do we get a great workout just swimming parallel to shore, but we also get sprint work in as well as working our legs as we try to kick within the wave so we can ride the waves as far into shore as possible. The combination of aerobic and anaerobic work in the ocean is a great mix to keep things enjoyable and challenging. When we add FINIS Agility Paddles to the swimming and body surfing workout, it is about a rigorous a workout as we can do. We swim parallel to shore, then sprint to catch any number of waves, then kick hard to remain within the wave, and then swim back out, diving under each oncoming wave, to swim parallel to the shore beyond the surf break. Over and over again, it is a great way to get our distance in while working on finishing a race or a triathlon swim leg. The need to immediately pick up speed and tempo in order to catch a wave when the swells come in is also an additional benefit. The FINIS Agility Paddles are nominated as the 2013 World Open Water Swimming Offering of the Year. Its nomination reads, "Its form factor is unique. Its benefits are unmistakable. Its color is distinct. 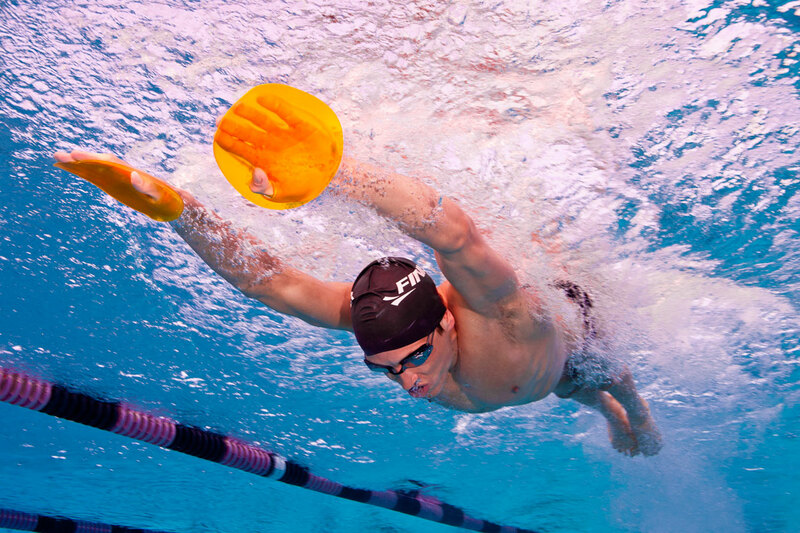 The FINIS Agility Paddles are oh-so-cool hand paddles that feel just right when you swim properly. Conversely, with sub-optimal hand movement through water, the paddles function as a fantastic self-teaching aid and a catalyst for stroke improvement. The bright yellow paddles enhance the swimmers’ tactile feedback and feel in the water, no matter what stroke they are swimming: butterfly, backstroke, breaststroke or freestyle. By elevating an athlete’s kinetic awareness, the paddles enable swimmers to make minute changes and discover the most optimal hand position throughout their entire stroke cycle. For its unprecedented convex shape, for its simplicity of design, for its fit like a one-sided glove, the FINIS Agility Paddles are a worthy nominee for the 2013 World Open Water Swimming Offering of the Year." The strapless FINIS Agility Paddles help swimmers and triathletes maintain proper fundamental hand placement during all four swim strokes. 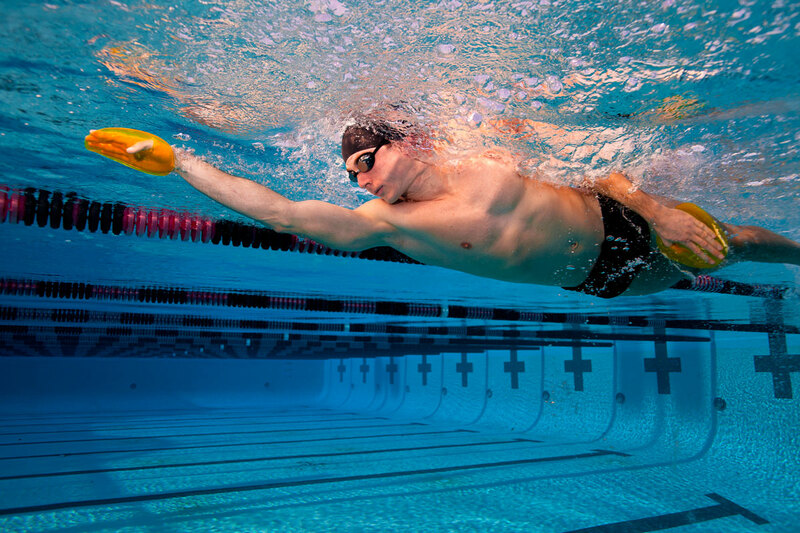 The convex design teaches proper palm positive hand position by encouraging the swimmer to have an early catch. The paddle will only remain in place if the swimmer maintains traction with the water, thus creating more propulsion and maximum efficiency - which is vitally important in the open water. 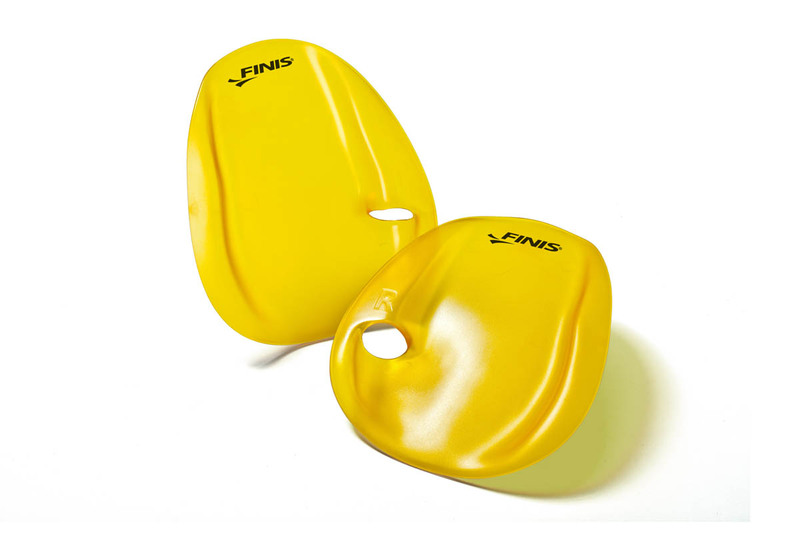 The FINIS Agility Paddles are quite simply cool and are a fantastic self-teaching aid that immediately enables athletes to become kinetically aware of their strengths and weaknesses in their swimming stroke. Because the bright yellow paddles just seem to fit like a one-sided glove on your hands, you can use them in the pool or out in the open water to help find and fix flaws in your stroke and hand position. Very importantly, the FINIS paddles are smaller than the massive paddles that are commonly used by competitive, collegiate and masters swimmers. But they are cleverly designed and have no tubing that is too tight, too loose or can deteriorate. The design of the paddles gives athletes instant tactile feedback from the water pressure on the paddle based on their stroke movements and hand position. The Agility Paddles can be used for all four strokes in the pool. In the open water, using the paddles is smooth and enlightening. From the time your hands enter the water to when your hands accelerate through the back end, athletes can feel exactly where and when pressure is optimally applied and where the plane of their hands is less than efficient. Any slight deviation from the optimal hand position makes the paddles come off and slows you down. At times, the paddles will slip off. At times, the paddles will seem to have a mind of its own. But the uncontrollable slippage is due to stroke technique flaws. In the open water, the paddles are a bit trickier to handle because of the surface chop that can occur. But under calm conditions in a lake or an ironed-out sea with no wind, the Agility Paddles work like a charm. Conversely, in a lumpy ocean where turbulence is the flavor of the day, there is constant unyielding pressure to focus on an efficient form in order to keep both paddles on, especially when sighting. Sighting with the paddles can particularly expose flaws as your head is raised, your hips are dropped, your elbows are relaxed and your hand position changes. It may require more than a few times to experience surface chop and sighting to get your stroke technique down correctly. You cannot ask anything more for an open water swimmer or triathlete. This entry was posted in Open Water Swimming and tagged FINIS Agility Paddles, World Open Water Swimming Offering of the Year on November 22, 2013 by WOWSA.